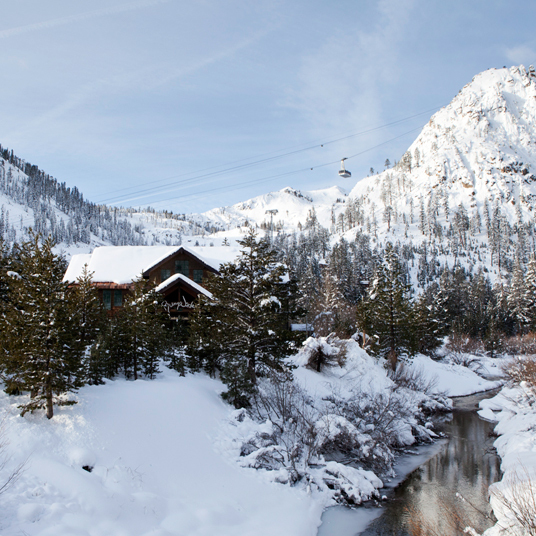 For a mountain lodge built to house the 1960 Winter Olympics delegation, PlumpJack Squaw Valley is surprisingly contemporary. In place of the expected Alpine kitsch are sunny clean-lined rooms and a casually elegant bar and restaurant. For skiing you’re naturally quite well placed, right at the base of the mountain in Squaw Village. And while the freshness of the design subverts our expectations for a ski-resort hotel, there other aspects of the fifty-six room inn are happily at home on the mountain: slope-side access just steps from the lifts, equipment storage and ski-valet service, a ski and snowboard shop with rentals available. Given the proximity to the lifts and all the walkable dining and shopping options, it would be plausible to spend a winter weekend here without getting into your car. Lake Tahoe is genuinely as appealing in the warmer months as well, and PlumpJack is no exception. Many of the rooms have views of the Sierras, which on closer inspection hold thousands of acres of scenic hiking trails. Then of course there’s Tahoe itself, the largest alpine lake in North America, and quite a pretty one to boot. The PlumpJack being an outgrowth of former San Francisco mayor Gavin Newsom’s highly regarded wine shop, it’s no surprise that the food and drink is taken seriously. PlumpJack Cafe, which serves fresh California-style cuisine, is on the short list of Tahoe’s finest. It’s all the better when they hold wine events and seasonal, chef-hosted farm-to-table dinners. For a more casual summer mood, pizzas coming from the big wood-burning oven by the pool are just as enticing, and a soak in the hot tub, in the fresh mountain air, is pleasant any time of year. Breakfast is included each morning of your stay, based on the following: King Rooms receive breakfast for 2, Queen Queen Rooms and Suites receive breakfast for 4 each. Breakfasts may not be redeemed for cash value. A nightly resort fee of USD 12 plus tax will be added to each guest room upon checkin.